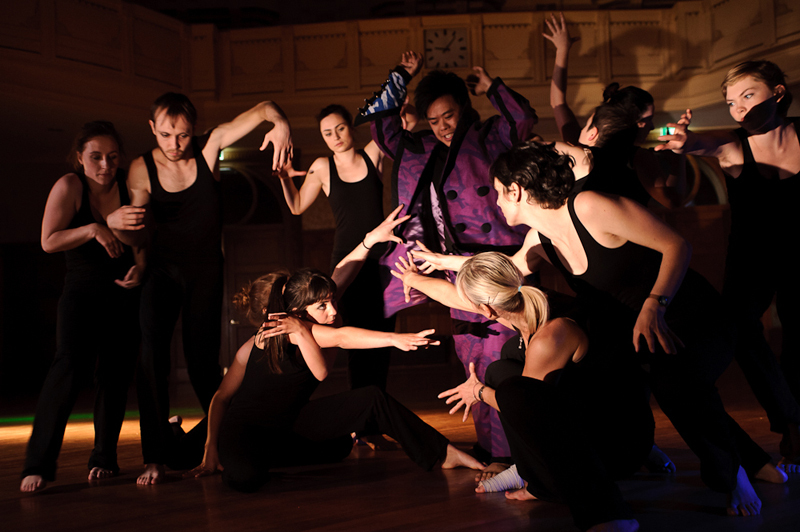 A collaborative dance performance produced by the Travel Art Dance Company that showed for three nights last week at the Northcote Town Hall. Set to the music of Tom Wait’s album, The Black Rider, the performance evokes a fairytale landscape of a dark forest, a lovesick couple and a mischievous devil who always has his way in the end. Taking as inspiration only the music and a short story written in the album’s sleeve insert, the performance is as discordant as a carnival, playful as a circus and creepy as a graveyard. Wait’s album is hardly the music by which to fall asleep, but Travel Art have successfully captured its bizarre and haunting energy. The Black Rider is directed by Meah Velik-Lord, who also performs as one of the six versions of Pegleg, the devil. These six each have their own personality and stage presence, but also share common cues and costumes. Elizabeth Bryant, who plays the fifth Pegleg, is our favourite. As a classically trained dancer, Bryant invigorates the jangling musical score with the elegance and power of ballet. Travel Art follows an open philosophy that welcomes all dancers, no matter their background, training or technical ability. 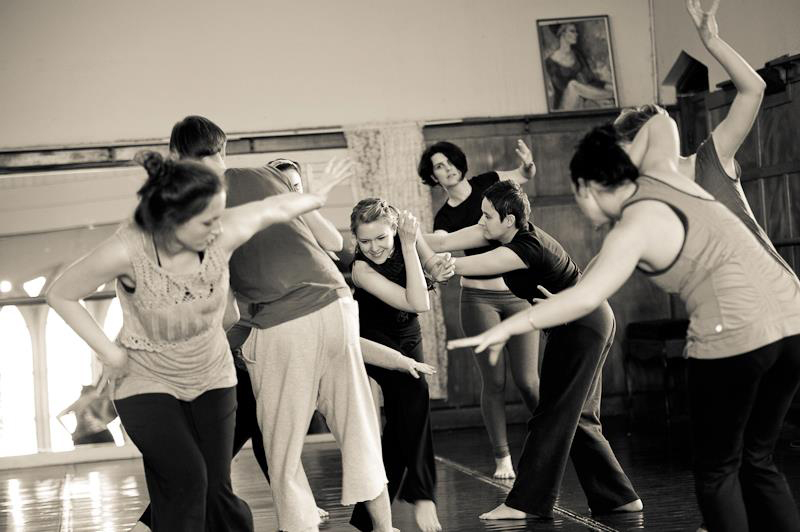 It also encourages dancer contribution to the choreography, which is at times scripted and others improvised. This is a fresh approach wholly suited to a small company and is well explored in The Black Rider. Like any experimental process however, there are some hits and misses. The scene that accompanies Gospel Train is a bit of both – while a train formed out of a conga line is too literal for our tastes, the arrival of Pegleg, orbiting around the train at a quicker pace gives a great sense of space and movement. An early scene comprising fractured reflections of the would-be-suitor, Wilhelm, where shadowy dancers haphazardly mimic his motions, is fantastic, as is one toward the end of the performance where he returns to the dark forest to seek the devil. Black-clad dancers, with fingers splayed like the gnarled branches of old trees, close in on Wilhelm, trapping him as the music reaches its crescendo. Despite some of the clunkier scenes, we enjoyed our experience of The Black Rider. It offered rewarding insight into an interesting collaborative process as well as a visual spectacle befitting the music that was its inspiration.